Keep your favorite beverages cool while enjoying a great round of golf. These Personalized Golf Can Wraps are excellent additions for your next golf outing, bachelor party or weekend out with the guys. Cold beer and golf are great together. 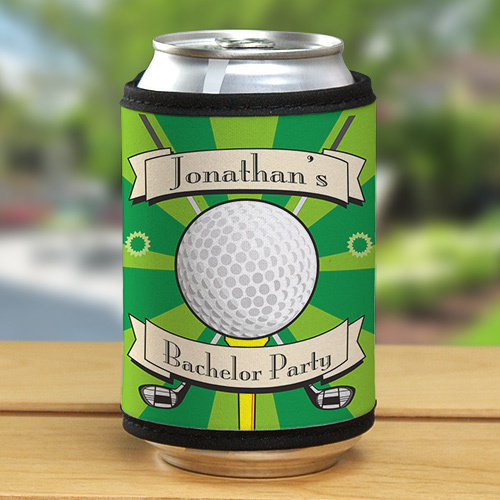 Keep your beer cold while hitting the ball straight at your next golf outing with Personalized Golfing Can Wrap. Buy a personalized set for a special personalized golf outing gift idea. Your Custom Printed Golf Can Wrap measures 4" x 9 1/2" with velcro closure around your beverage bottle or can. Personalized can & bottle wrap includes FREE Personalization! Personalize your Golf Can Wrap with any two line custom message. Perfect for cans! Especially being personalized! I love it! I did not realize it was a velcrow type application..
Personalized Can Coolers and Custom Printed Can Wraps are great Father's Day gift ideas, bachelor party gifts or summer picnic gift ideas. Your 4th of July party will be a great hit with these fun, colorful Personalized Can Wrap Koozies.